Towners Pond is one I am looking forward to fishing again soon. It's a small pond just off of Swains Pond Rd that appears to have no shore access but actually has a very accessible shoreline via a path that goes around nearly the entire pond. 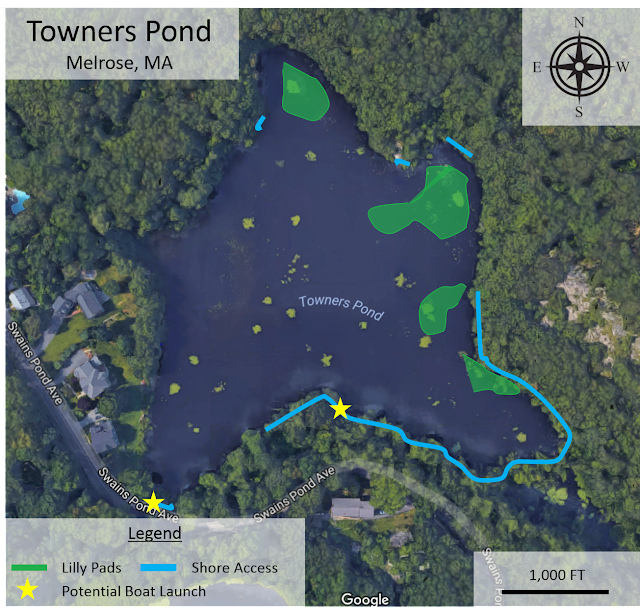 If you park on the southwest side of the lake on Swains Pond Ave, you'll find a couple paths that lead you down to the water. Along this path, you'll find a multitude of spots to cast from. There are a couple of spots that you could drag a kayak or canoe down to but having a boat is not a requirement to get some good action here. Along this path, you'll have access to some pockets of lily pads and a bunch of laydowns along the shoreline. If you walk over to the northern shore, you'll find a nice big rock outcrop that actually has a wooden platform to fish from. A little further down that path, on the north east shore is another big rock to fish from. I've only fished this place twice but I pulled in plenty of fish in the couple of hours I had here. Most of them were small, with 2-3 going in the 2-2.5 lb range. I talked with a guy there who showed me pictures of a couple of 4s that he pulled out of there, which is awesome for a pond that size. I fished mostly senkos here, throwing them deep into the lily pads. I had a lot of strikes right as it hit the water or at the surface as I brought it in. I threw some top water baits like my Whopper Plopper and 7in Slammer but didn't get any bites. I'm certain if I stuck to it and went at the right time, those baits would produce a great bite. There's really not much more to this place. Now get out there and hook up with a good one. If you guys have any success or know any more about this place, feel free to let me know in the comments. Tight lines!